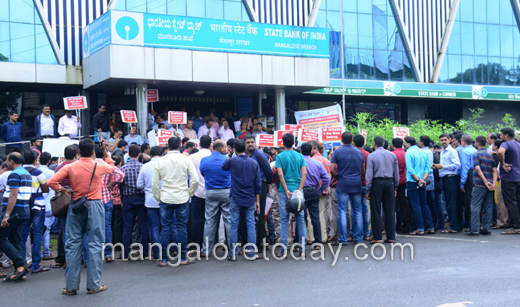 Mangaluru, Aug 22, 2017 : Banking activities in Dakshina Kannada was paralyzed on August 22, Tuesday. 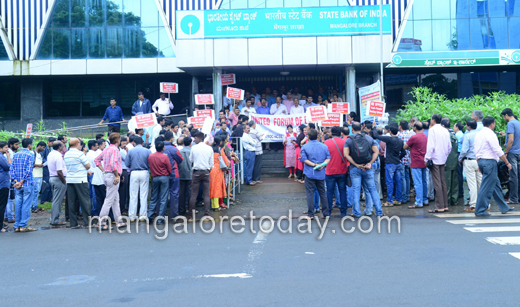 The employees of various public sector banks boycotted work, staged a protest near the State Bank in Mangaluru in response to a call for a nationwide strike by the United Forum of Bank Unions (UFBU). 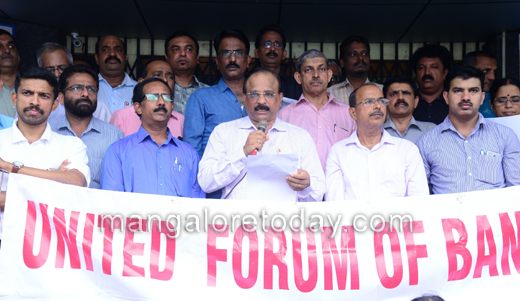 The strike was carried out on issues and demands of bank officer’s and employee’s including retires. Also against the government’s move to amend the banking laws bill, presently pending before parliament and scheduled for discussions.Privatisation, merging of nationalised banks, and waiver of corporate debts should be stopped. The government should ensure facilities for government employees and stringent measures should be taken to recover loans.The Government is very serious in continuing the retrogate reform measures ignoring the real menace in banking industry, alarming increasing bad loans. The protesters raised voice against the ’anti-employee’ policies of the union government besides raising a host of other demands. The bank strike affected public to a great extent. Services like deposits and withdrawal at bank branches, cheque clearance, NEFT and RTGS transactions were affected.